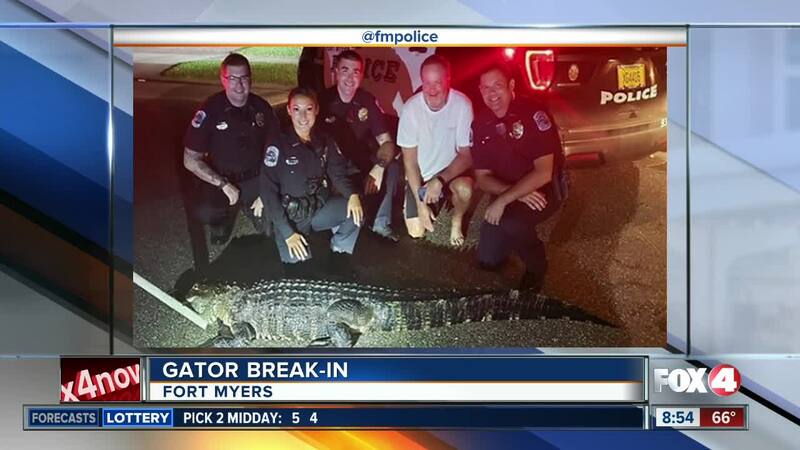 According to Fort Myers Police, a nearly 8-foot alligator was found camped out on a resident's back porch around 2 a.m. Friday. FORT MYERS, Fla. -- A Fort Myers homeowner was rudely visited by some local wildlife early Friday morning. The reptile had ripped through the lanai screen. Fort Myers Police and Florida Fish and Wildlife responded to the home, where the alligator was captured and safely relocated. But not before officers Hernandez, Beiner, Martins and King took a moment to snap a photo with the culprit.